As I mentioned yesterday, I have been a busy bee for the last few weeks. I just got back from a lovely Ladies Week in Cape Cod and Martha’s Vineyard…If I haven’t answered your questions–that is why. I will answer all the questions over the next few days. Also, a few of you have contacted me that mysteriously, you are no longer receiving The Inbox Jaunt in your e-mail…please contact me if this is happening to you. (lckennedy@hotmail.com) This is a recurrent problem that I have to take up with the wizards at Word Press…last time the fix was only temporary… Thank you for being so patient! Please continue to join us! I am much better behind my sewing machine than under the hood of a computer! Aarrgghhh! This week we are going to do three short tutorials using the circles we have been practicing. See Dots and Dashes and The String of Pearls tutorials. All of the tutorials this week will look great on any floral quilt and would be great to tuck into free motion quilted flowers. Begin by stitching a full circle. 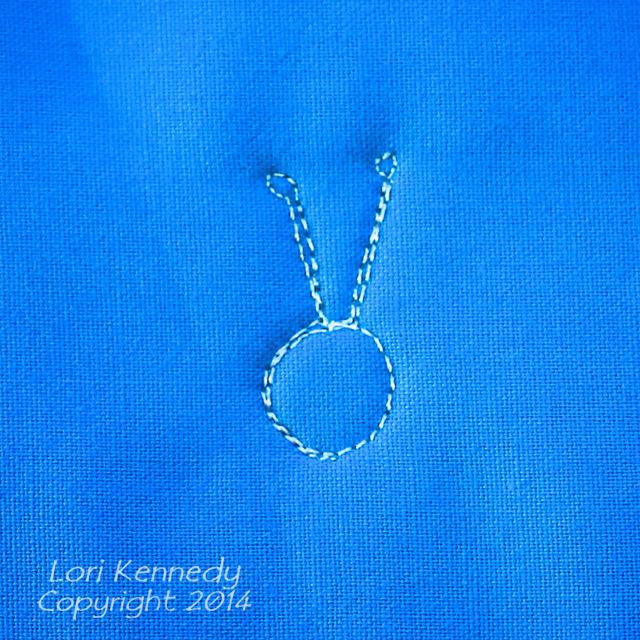 In the sample below, the circle is a bit smaller than a dime. 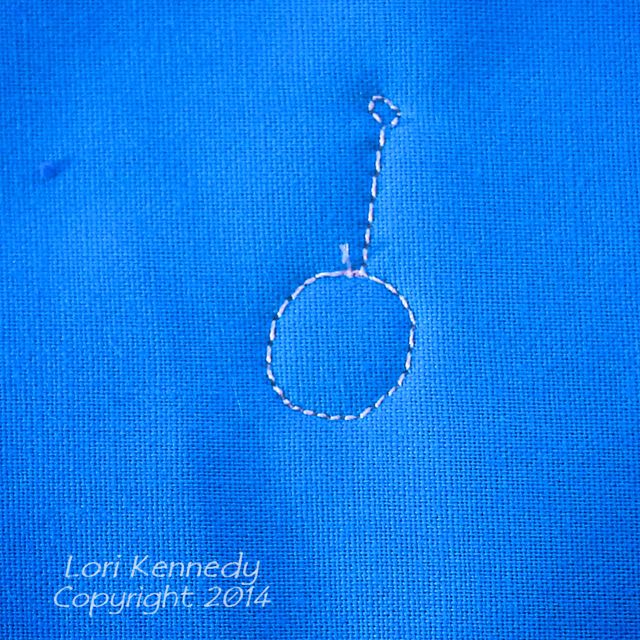 Next, stitch a straight line and a very tiny circle for the antenna. Stitch ON or VERY CLOSE TO the straight line and back to the circle. Stitch over two stitches and repeat to create a second antenna. 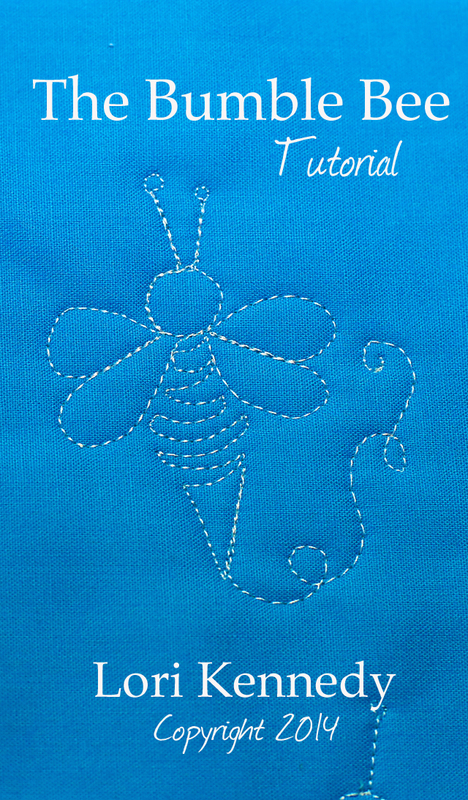 From the “chin” — Stitch two tear-drop shaped wings—then two stitches under the bee’s chin. 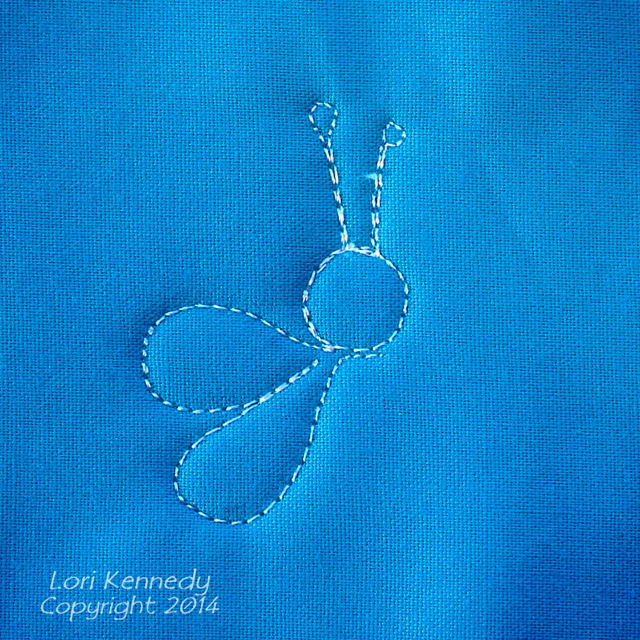 Stitch back and forth to create the body of the bee. Make the center of his body a bit wider than the upper and lower body. Add a twisted line…the bee’s line of flight…. Bumble bee, chases me, I PICK YOU! PS…More garden fauna free motion quilting tomorrow and Thursday. PPS…All tutorials, images and information are the property of Lori Kennedy at The Inbox Jaunt and are intended for personal use only. Feel free to re-blog and Pin with attribution to The Inbox Jaunt. For all other purposes, please contact me at lckennedy@hotmail.com. Thanks! NOTE-Stitched with Aurifil 50wt in the bobbin, Sulky 40wt Rayon on top on my Bernina 150–domestic sewing machine without a stitch regulator. This is just too cute! You are so sweet for sharing your talents. Thank you. I wonder if your brain ever takes a rest or is it that with your home activity it is much easier to wander & cleverly create. I’m still recouping from the dreaded radiation but love reading/studying over & over your creations. I must thank you for your generous spirit. Really love this one, thank you! Got to try this one. Maybe on my next project. Being an armature bee keeper I thank you. 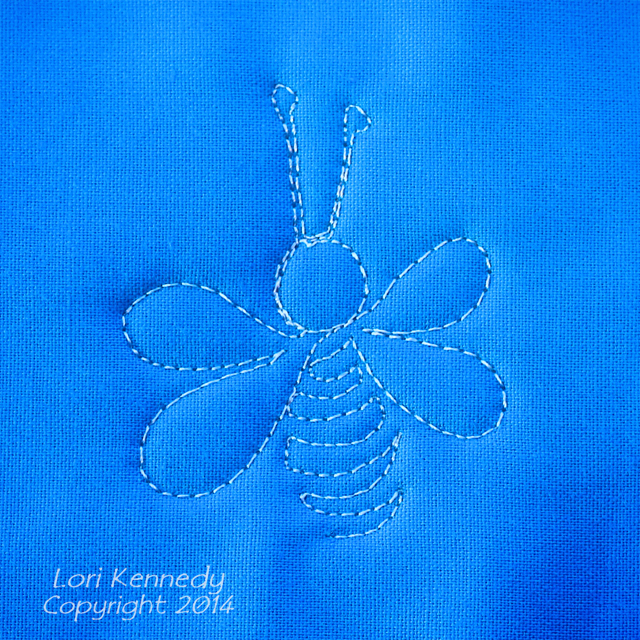 I love putting bugs and bees in my childrens quilt. Yours have so much whimsy. Love it. For emails from you going in to people’s spam folder… there’s not much WordPress can do. It’s happening on the receiving side, so people have to train their inboxes that theme emails are not spam. Some email providers (like hotmail) discard automated emails like post notifications AND password resets. also the bees is FREAKIN ADORABLE. I just shipped a bee themed quilt to a customer and it would have been cute to hide this somewhere in it. PS – I get such a kick out of seeing you in American Quilter! Super cute Lori!!! Love it! This, I love! The design and movement are wonderful. This is a super cute design. Love this and all your free motion tutorials. You are amazing and I know I appreciate that you share your talent with us. I’m trying to print out some of my favorite tutorials (ok, they’re all my favorites) so I can practice with the instructions by my machine, and I found that when I click on the spider web it takes me to the pumpkin tutorial. Just thought you’d like to know about that little glitch. Thanks again! I really look forward to your posts. Thanks for letting me know. I will fix this today. This is adorable. Can’t wait to try it. You are truly amazing. So cute! You make it so easy too. Thank you so much for sharing! You break it down and really make it doable. Great pattern as always. You are my hero when it comes to machine quilting designs! Had to try it when I went home for lunch, Sooooooooo cute and surprisingly easy. Looking forward to the next design! Okay, can you get any cuter? This bee is a sweetie. 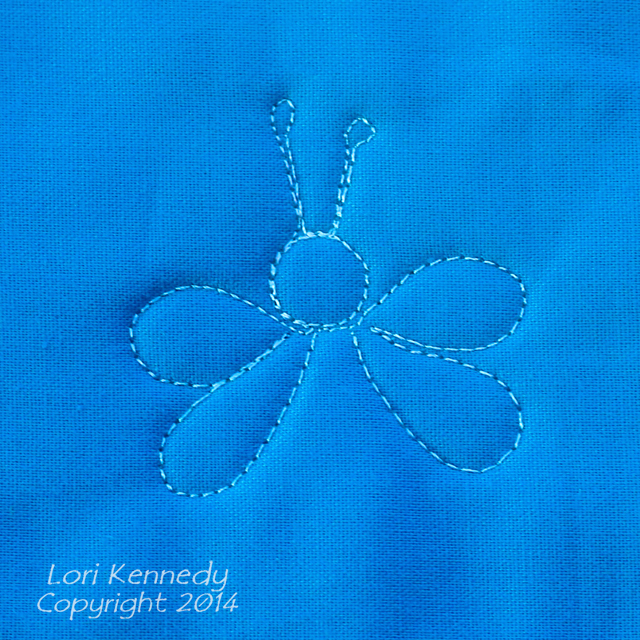 I like Sillyandrea’s idea of hiding a motif like this on a child’s quilt. I have a quilt that has been desperately waiting for me to quilt in some dragonflies. I bet I can stretch those wings out and make this work. Thanks for another great tutorial. So cute. I do not know how you come up with these designs! They always amaze me. Love your blog. Hope you are working on your book. This bee has to bee 🙂 included. I absolutely love this. I am a newbie and I have been getting my sewing space set up so I can try free motion quilting. Thank you so much for sharing all your ideas and clearly showing how to get started. It is wonderful that you are continuing the tradition of passing your skills on to others. It is wonderful to have a chance to share in your creativity. You are a blessing to others. Acabo de descubir tu blog y te doy las gracias por los tutoriales que haces del acolchado libre, a las principiantas nos viene muy bien. Un saludo. Love he bee. 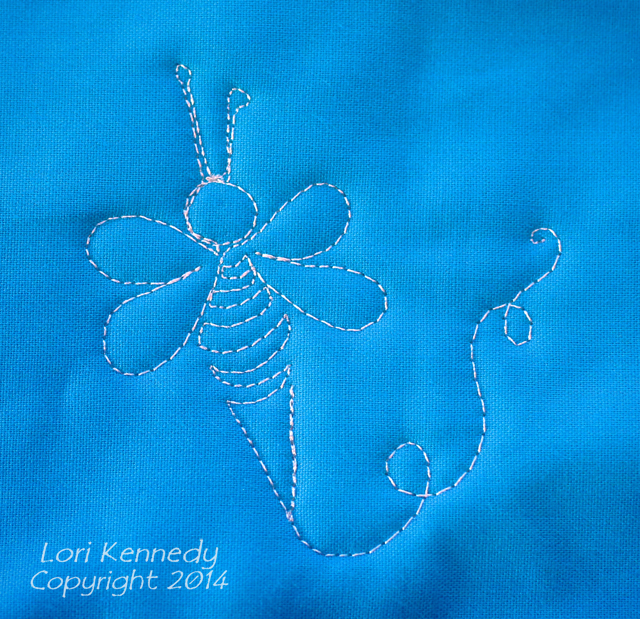 I tnink K should stick with your wonderful tutorials and sell the longarm. It is driving me crazy and you provide fun things that are in my range of ability. Thank you for your tutorials. I am teaching myself and your tutorials are very good and helpful.